The Cats who Came for Christmas. 1999 — A week before Christmas and all through the house, a creature was stirring – it wasn’t a mouse. A small, fluffy tortoiseshell cat, perhaps 6 months old had taken residence in my mother’s bottom garden. Shortly thereafter, two tiny kittens – a ginger and a tortie emerged from the shrubbery. My mother fed them, christening the mother cat Blaze. Blaze allowed my Mum to touch her, but the kittens were wild. On Boxing night I was sitting outside with my mother and Blaze was roaming around the yard. We went inside. A few minutes later Blaze was at the door yowling and crying. I opened the door and Blaze stepped inside. She sat by the door and called her kittens. Slowly, reluctantly, they answered her call, tentatively coming through the door, while Mum and I hid behind the sofa. Once the kittens were inside I snuck around and closed the door. Terrified, the kittens raced around the room, over furniture, up curtains, narrowly missing the chimney (which I had blocked up with cushions taken from the sofa – I’d rescued wild cats before and knew they went into a frenzy when cornered). Blaze ran from kitten to kitten, screaming, trying to calm them down. Eventually, Mum and I managed to get hold of the kittens, to try to comfort them. They were so fragile when we held them in our cupped palms. For the next few days, they acclimatised living in the laundry of my Mum’s home. When it was time to find homes for them, I told my Mum: – “No way am I breaking up the family, they’re coming home with me.” I brought two cat cages and put Blaze inside one, the kittens in another. The desperately sad look on Blaze’s face, her head hanging in defeat, tore at my heart – obviously she knew what a cage was, and had trusted her former human to put her in it—she had been dumped with her kittens from a cage! I will never forget Blaze’s look. I wished I could tell her that she and her kittens were going to their forever home and not to be dumped again! Once at my home, I put them in the spare room attached to my office by a sliding door. They stayed in there for a week or so getting used to their new surroundings. I went in there many times each day to get them used to me; the kittens would always run and hide behind the cupboard. I looked down over the top of the cupboard to be greeted by hisses and posturing from furballs little bigger than my hand. I named the tortoiseshell “Katie” and the ginger “Peter”. Katie befriended me within days. I began to leave the door to my office open and would look around as I worked at the computer to see the kittens peering at me from around the corner of the cupboard. Katie and Blaze settled in, but Peter remained elusive. One day as I was at the computer I saw Peter inching forward to sit by the door watching me. A few minutes later I put my hand down and she touched my fingers with her nose. She had decided I was no longer a threat. Perhaps curiosity overcame caution – what was the funny human doing? Blaze, Peter and Katie had arrived. When I took them to the vet for neutering, I discovered that Peter was in fact female, much to the amusement of the vet and his staff. (It’s rare for a ginger cat to be female, so I heard. I had always believed that all gingers were male). Peter became “Peta”. When I opted for a “tree change”, my other cats as well as Blaze, Peta and Katie made the transition from the city to rural living, and enjoyed the new palatial cat run attached to my house. Seven years later, Peta became ill. The vet discovered she had a congenital kidney defect which ordinarily would have killed her at aged 3 – but the vet said that because I look after my cats so well, Peta survived with the defect for so long. Blaze died in late 2013, and Katie is still with me. Katie is my “welcome wagon”. Whenever a new rescuee cat is introduced to the family it is she who sticks her nose under the door to my “integration” room (where I let new cats settle in before moving out into the house). And then once the new cat is out in the house, she will be the one to meet and greet—whether the new arrival wants it or not. Katie doesn’t take no for an answer and extends her paw in friendship. So, whenever I look at Katie, I remember that last Christmas with my mum, (Mum died the following year), and the arrival of Blaze and her kittens, and a new life for me in the country. Little did I know that there would be more cats finding their way to me—some at Christmas, others at various times of the year. My cats give me inspiration to write my books—especially if I have a cat shifter hero. Gyng, the irrepressible Monsters inK mascot is modelled after Zak who was dumped on my property as a 6 week old kitten. I lured him into my garage after 7 days, closed the door and fed him under my car. He took up residence on the wheel rim of my car, so I had to borrow a friend’s car when I wanted to go shopping, or have local businesses deliver groceries, etc. since “the cat borrowed my car”. Zak soon decided that he wanted out of the garage and howled at the door leading from the garage to my home. I took him to the integration room. Within 3 hours he was out of there—and strutting around the house as if he owned it. 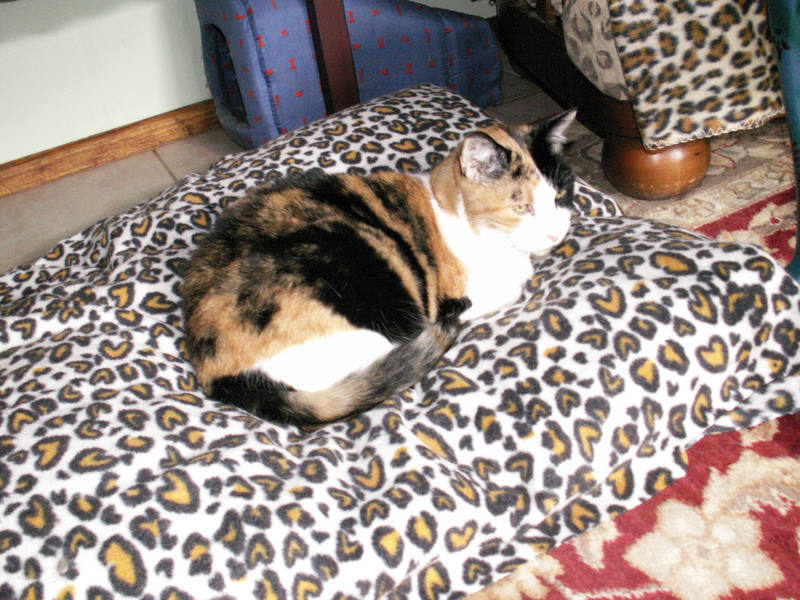 Sadly, a few weeks after writing this, Katie succumbed to cancer and crossed over to Rainbow Bridge. Welcome to my blog spot. My tastes are many, but animal rescue, gardening, reading and writing and craftwork, including costuming are my favourite interests. I’m a published author and have been writing professionally for over 20 years. I also edit manuscripts professionally as well as work as creative consultant. Sometimes, there are never enough hours in the day! Thank you for visiting my blog. Please drop by again, and/or leave comments.